There is a great richness in our world, much of it lent by the many ethnic festivals and celebrations. 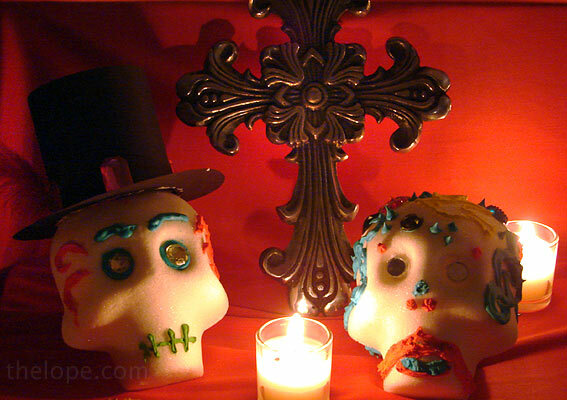 Día de los Muertos - The Day of the Dead - is one of my favorites. Now, I spend most of my time in central Kansas and usually have to really scratch for something to photograph in order to pay tribute to this celebration of the lives of those now departed. 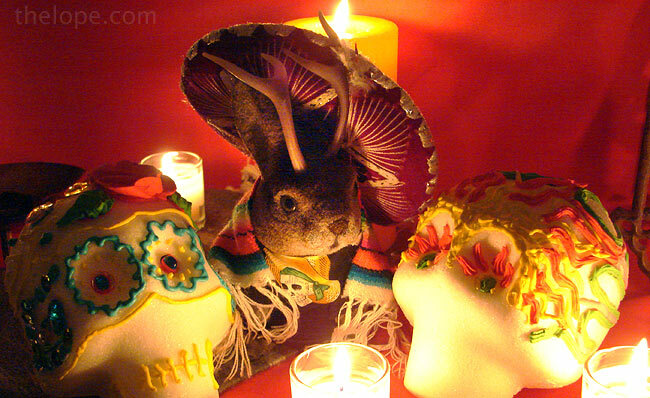 In previous years I've used souvenirs and photos from a trip to Mexico as in 2005's Happy Day of the Dead and 2007's Dias de los Muertos. 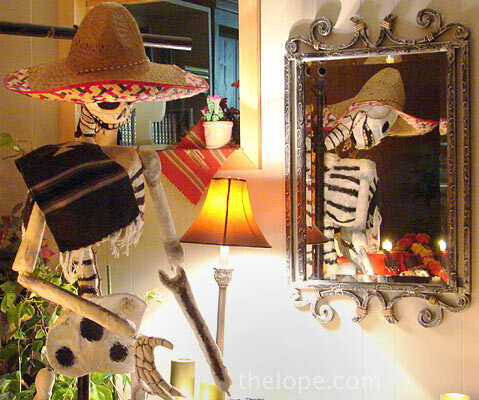 This year, I lucked out as a local business in Hutchinson, Kansas, had a Day of the Dead alter display, courtesy of the Hutchinson Community College sculpture class. All of these photos were taken at Spanish Interpreting and Translation at 115 South Main in Hutchinson, during the "Third Thursday" event on October 16. Third Thursday is a promotion in which many of the local businesses stay open late, bands play, fun is had, etc. If you're near Hutch on a third Thursday, you really should go. 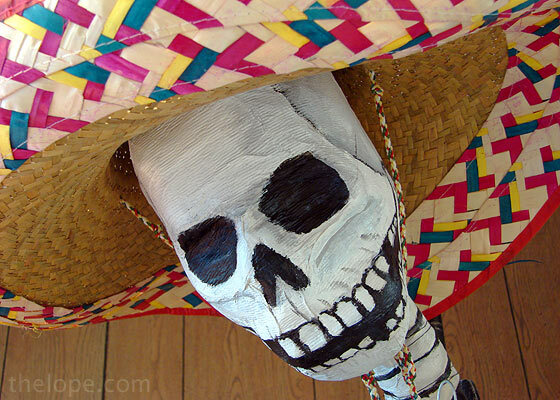 Ace had actually had a sombrero and a Day of the Dead kerchief in his huge wardrobe stash. 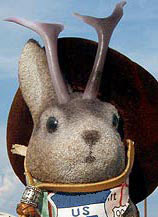 A good traveller and culture buff is always ready for anything, you know. 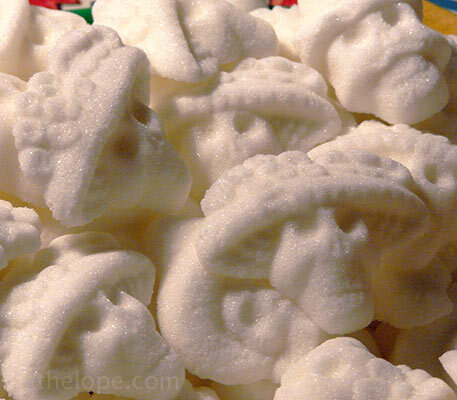 The display furnished sugar cookies in the shapes of skulls with hats. The sculpture class even made a dog. 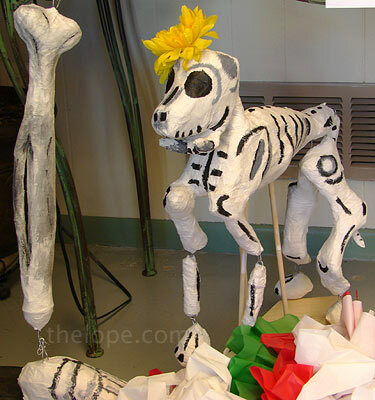 It's not unusual to see a bit of whimsy in Day of the Dead displays, and often animals are featured. 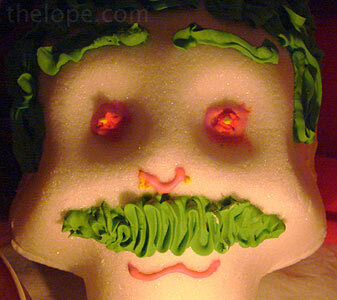 If you're wondering just what Day of the Dead is, Palomar College has a rather detailed website dedicated to it, here. And here's a good summery by Carlos Miller of the Arizona Republic. Of course, Wikipedia also has an entry. 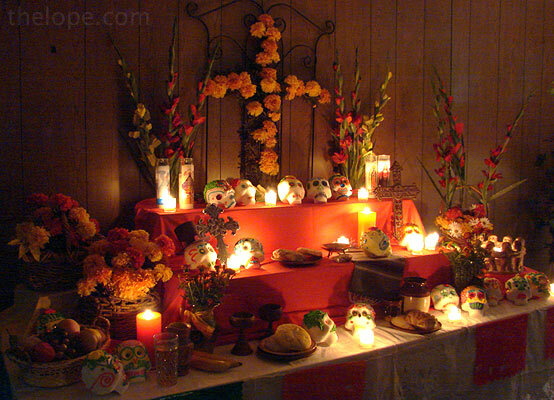 It's beautifully complex, but briefly, Day of the Dead is a pre-Hispanic holiday celebrated which honors the dead with alters, feasts, candy skulls, etc. Like so many pre-Christian holidays, the Catholic church sought to subvert it with their own observances, in this case All Saints' Day and All Souls' Day. 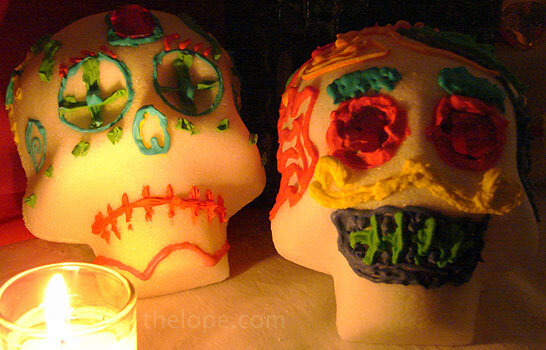 In some Hispanic subcultures, Day of the Dead is celebrated over two days, November 1 and 2, with the former being dedicated to children and the latter to adults. Ahh, how I love it when Catholicism tries to wipe out a pagan holiday and only succeeds in morphing it into something that survives today. Candy skull, anyone?